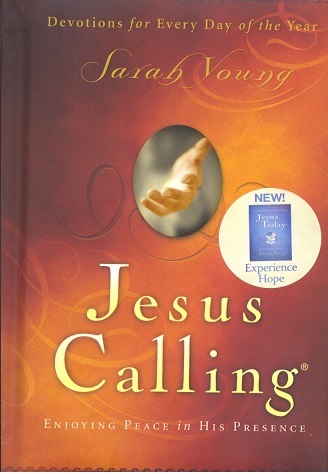 Jesus Calling is a very popular devotional book by Sarah Young, published in 2004 by Thomas Nelson. It has a devotional for every day of the year. The devotionals are written in first person ("I"), as if Jesus were speaking. Many have found this book to be very helpful and inspiring when it comes to practical Christian living. The author does share some very helpful thoughts about focusing on Christ and trusting Him in our daily walk. In spite of the positive aspects of this devotional book, I was very concerned when I read the preface. One of the key issues facing believers today is this: Is the Bible totally sufficient or not? Is the Bible all that we need for faith and for practice, or do we need something else? Is the Bible all the truth that a believer needs, or is it lacking in certain respects? Do we need something in addition to the Bible or is the Bible enough? Do we need additional revelations that are not in the Bible? One of the clearest declarations of the all-sufficiency of God's Word is found in 2 Timothy 3:16-17: "All scripture is given by inspiration of God, and is profitable for doctrine, for reproof, for correction, for instruction in righteousness, that the man of God may be perfect, thoroughly furnished unto all good works." The expression "thoroughly furnished" means "completely equipped, fully fitted." In Western states such as Colorado, hunting, fishing and camping are a big part of life. There are people called “outfitters” who pack horses with all the needed equipment and provisions, so as sportsmen go into the mountains to hunt or fish, they have everything they need. They have their bedding, their food, their matches, their ammunition, their fishing tackle—everything they need is provided. So also as believers we are outfitted with God’s Word, and God’s Word has everything we need to serve Jesus Christ. Nothing is missing; nothing is lacking. God knows what we need and He provides it through His Word. God's Word is totally sufficient. I began reading God Calling, a devotional book written by two anonymous "listeners." These women practiced waiting quietly in God's Presence, pencils and paper in hand, recording the messages they received from Him. The messages are written in first person, with "I" designating God. Soon, messages began to flow more freely, and I bought a special notebook to record these words...I have continued to receive personal messages from God as I meditate on Him. The devotionals are these personal messages which she claims to have received from God, which is why they are in the first person, as if spoken by Jesus. Sarah Young is saying that she received new communications and fresh revelations from God, thus claiming herself to be a direct channel through whom God speaks to us today. Though she does not see these messages as contradicting the Bible, she does view them as additional communications which God has given especially to her, that she might share them with others. These are extra-Biblical revelations. Though she does not say this, she is in effect claiming to be a prophetess, receiving direct messages from Jesus Christ, and writing them down exactly as He gave them. In two places Sarah Young tried to offset these amazing claims. On page xii she wrote, "I knew these writings were not inspired as Scripture is, but they were helping me grow closer to God." But if these were direct communications from God, why would they not be inspired? Did she really receive messages from God or not? On page xiii she wrote, "The Bible is, of course, the only inerrant Word of God; my writings must be consistent with that unchanging standard." But again, if these communications came directly from Jesus, would they not be without error? We appreciate Sarah Young's desire to elevate the Bible above her revelations, but we still have major concerns about her claims that she is receiving direct communications from heaven. Careful Bible students have always made a clear distinction between revelation (the truth that God reveals to His chosen prophets and Bible writers) and illumination (God shedding light on the Scripture so that His people understand the truth). God does not give new revelation today because He has already given to us His Word, and He has given strong warnings about adding and subtracting from that body of truth (Deut. 4:2; Prov. 30:6; Rev. 22:18-19). Today, by the illumination ministry of God the Holy Spirit, the Lord can help His children to understand and apply His Word to their daily situations. We do not need new messages from God, but we need help and illumination from the Spirit of God to understand and to apply the God-inspired Scriptures (2 Tim. 3:16) which God has already given to us. The gift of prophecy has been done away (1 Cor. 13:8). The apostles and prophets were foundational men (Eph. 2:20). They were needed in the infancy stage of the church, but when the Scriptures were completed, the gift of prophecy was no longer needed. God's Word is totally sufficient; what more do we need? I have heard many fanatical persons say the Holy Spirit revealed this and that to them. Now that is very generally revealed nonsense. The Holy Ghost does not reveal anything fresh now. He brings old things to our remembrance. ‘He shall teach you all things, and bring all things to your remembrance whatsoever I have told you,’ [John 14:26]. The canon of revelation is closed; there is no more to be added. God does not give a fresh revelation, but he rivets the old one. When it has been forgotten, and laid in the dusty chamber of our memory, he fetches it out and cleans the picture, but does not paint a new one. There are no new doctrines, but the old ones are often revived. It is not, I say, by any new revelation that the Spirit comforts. He does so by telling us old things over again; he brings a fresh lamp to manifest the treasures hidden in Scripture; he unlocks the strong chests in which the truth had long lain, and he points to secret chambers filled with untold riches; but he coins no more, for enough is done. Believer! There is enough in the Bible for thee to live upon for ever. If thou shouldest outnumber the years of Methusaleh, there would be no need for a fresh revelation; if thou shouldest live till Christ should come upon the earth, there would be no necessity for the addition of a single word; if thou shouldest go down as deep as Jonah, or even descend as David said he did, into the belly of hell, still there would be enough in the Bible to comfort thee without a supplementary sentence. One additional comment on Sarah Young's devotional book. As I flipped through the pages, I read very little about the cross or the resurrection. The believer's identification with Christ in His death and resurrection are foundational truths for living the Christian life as the following document shows: The Christian Life and How It Is to be Lived. For a fuller discussion of how the cross and the empty tomb relate to the Christian life, I would recommend The Complete Green Letters by Miles Stanford.